Some 600,000 Florida residents were without power Friday morning as Matthew's center spiraled 40 miles off Cape Canaveral. Officials say that number could rise to 1 million. The hurricane hasn't made landfall, but Gov. Rick Scott says it "still has time to do a direct hit." He expressed particular concern for low-lying areas like Jacksonville, but says he won't extend the state's voter-registration deadline, per the Tampa Bay Times. Some 4,500 flights scheduled for Wednesday to Saturday have been canceled, including to and from Orlando, Atlanta, Charleston, and Savannah. 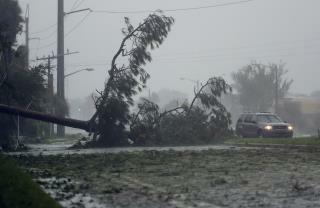 Airports in southern Florida are expected to reopen midday Friday. Kennedy Space Center seems to have gotten off mostly scot-free, at least so far. The worst damage on site appears to be to the roof of an office building. The storm is expected to hit South Carolina on Friday afternoon with winds of more than 40mph. North Carolina Gov. Pat McCrory says southeastern parts of the state could see a foot of rain from Friday night to Sunday morning, with wind gusts above 65mph. Meanwhile, the Red Cross and UNICEF are asking for donations to provide food, water, and shelter to some 50,000 residents of Haiti, where more than 280 people died as a result of the storm earlier this week. Another self-evident truth from YOUR democratic leader.